Book Review: BLEAGH & BLEEP! Remember BLEAGH, the colourful friendly monster who went to school for the first time? I reviewed the book back in April this year and personally, I loved the book as the life lessons that are covered in the book just happen to overlap quite neatly with some of positive messages I try to reinforce in my children. Values like empathy, tolerance, creativity, cooperation, appreciation and integrity. And what do you know - he is back for more and this time, he has got someone else together with him! The book immediately continues where the previous book has left off. BLEAGH returns home eager to share his new experiences after his first successful day at school. But as everyone with siblings will know, siblings can sometimes get in your way... and in BLEAGH's case, it's BLEEP, his baby sister. Together with his sister, BLEAGH learns important values such as respect, independence, commitment and confidence and the two siblings team up to become an unstoppable learning force. Once again, I found the book to be very entertaining and educational. Beautifully illustrated with bold, vibrant colours, the book has taken on difficult-to-explain topics and translated it so skillfully and in such child-friendly language. And it certainly made it so much easier for me to explain the meaning of these values to the boys! But it still didn't stop them from exclaiming 'BLEH! BLEH! BLEH!' throughout the course of the book... and to top things off, Ale joined in the ruckus by repeating 'BLEEP! BLEEP! BLEEP!' as well. Ah well, perhaps the next book should inculcate the value of 'Silence is Golden', no? All in, this book uses a lighthearted and engaging story which provides a great opportunity to have some great discussions with your kids about certain key values in life. And that itself, is priceless. 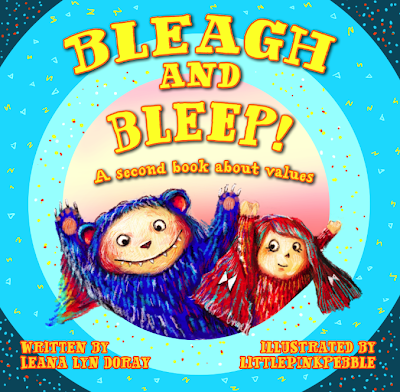 We have one copy of BLEAGH & BLEEP! : A second book about Values to give away! All you have to do is to 'Like' BLEAGH's Facebook page HERE. Leave a comment either in this blog post or on the Facebook post of this blog entry HERE once you have done so. Simple as that! Giveaway will close on 14 October 2013, 2359hrs and results will be announced on Facebook on 17 October 2013. The giveaway is open to everyone with a valid Singapore Address for delivery. CONGRATULATIONS to KM WONG on winning a copy of the book! Please drop me an email at kelvin(at)cheekiemonkie.net with your address so that I can mail the book to you. Thanks! Would love to win this to read it to my boys! They would be charmed by Bleagh and Bleep! Sounds like an equally awesome second-parter to the first book. Pick me!! I love to have the book for my boys! I wanna to win this book as a birthday 'surprise' gift for my daughter's birthday. Hi I really enjoy reading your blog daily. You always share interesting things that happened to your family and also useful tools too! Hi, I was introduce to ur blog by a fren recently & really appreciate all your sharing. It gives me ideas on how & where to spend time w my 2 girls! I have liked the page & would def wish to be able to share the book with my girls too!